You’re in the thick of training just a few weeks away from your big goal race, and then one morning you step out of bed to discover a new pain – a pain far worse than the everyday soreness you know too well. So what does the doctor prescribe? You guessed it. Time off. These two words are pretty much the last thing we runners want to hear after months and months of hard work, and the thought of scrapping all that work and starting over after your goal race has come and gone can be demoralizing. Enter Dr. Christopher Segler of Doc On The Run, a San Francisco-based practice that specializes in podiatry and running injuries. 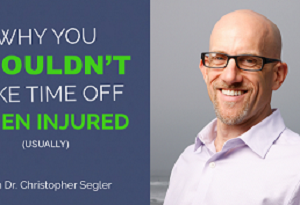 An accomplished marathoner and Ironman triathlete, Chris knows full well how frustrating injuries can be, which is why he’s devoted his life’s work to getting sidelined runners healthy and back to the grind as fast as possible. So what’s the first step to a speedy recovery? According to Chris, don’t take time off. Despite those conventional protocols to which we’re accustomed (“six weeks off” ring any bells? ), Chris maintains time off is not only unnecessary, but it’s also counterproductive to recovering from most injuries. In this episode of Run to the Top, Chris will dispel the myths surrounding injury and discuss better alternatives to time off – methods that help you bounce back not only stronger than before but also equipped with the knowledge crucial to preventing future injury.